I first became aware of this research in an ISBA4 abstract, and now it seems that a full article has been published in PLoS Biology. Today, a fascinating new paper has appeared which completes the picture by studying for the first time both mtDNA and Y-chromosomes from a Central European Linearbandkeramik site, Derenburg Meerenstieg II in Germany. We successfully typed 17 individuals for mtDNA, which together with a previous study  provided data for 22 individuals from the Derenburg graveyard (71% of all samples collected for genetic analysis; Tables 1 and S1), and significantly extended the genetic dataset of the LBK (n = 42), to our knowledge the largest Neolithic database available. Table 1 has a summary of the new data. Two individuals belonged to Y-chromosome paragroup F*(xG,H,I,J,K), and one to haplogroup G2a3. Out of 25 different haplotypes present in 42 LBK samples, 11 are found at high frequency in nearly all present-day populations under study, a further ten have limited geographic distribution, and the remaining four haplotypes are unique to Neolithic LBK populations (Table S4). This suggests to me that there has not been massive extinction (due to selection or any other factor) of the Neolithic gene pool, as only four unique haplotypes to LBK individuals were found. Moreover, even these could potentially still exist, although they might not have been sampled yet. The 11 widespread haplotypes are mainly basal (i.e., constituting a basal node within the corresponding hg) for Western Eurasian mitochondrial hgs H, HV, V, K, T, and W. While these haplotypes are relatively uninformative for identifying genetic affiliations to extant populations, this finding is consistent within an ancient population (5,500–4,900 cal B.C., i.e., prior to recent population expansions), in which basal haplotypes might be expected to be more frequent than derived haplotypes (e.g., end tips of branches within hgs). The next ten LBK haplotypes were unequally spread among present-day populations and for this reason potentially contain information about geographical affinities. 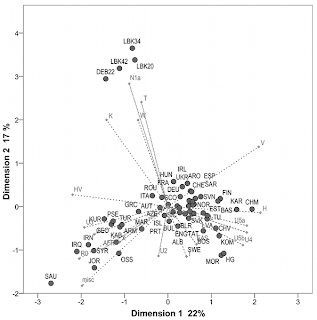 We found nine modern-day population pools in which the percentage of these haplotypes is significantly higher than in other population pools (p>0.01, two-tailed z test; Figure 1; Table S4): (a) North and Central English, (b) Croatians and Slovenians, (c) Czechs and Slovaks, (d) Hungarians and Romanians, (e) Turkish, Kurds, and Armenians, (f) Iraqis, Syrians, Palestinians, and Cypriotes, (g) Caucasus (Ossetians and Georgians), (h) Southern Russians, and (i) Iranians. Three of these pools (b–d) originate near the proposed geographic center of the earliest LBK in Central Europe and presumably represent a genetic legacy from the Neolithic. However, the other matching population pools are from Near East regions (except [a] and [h]), which is consistent with this area representing the origin of the European Neolithic, an idea that is further supported by Iranians sharing the highest number of informative haplotypes with the LBK (7.2%; Table S4). The remaining pool (a) from North and Central England shares an elevated frequency of mtDNA T2 haplotypes with the LBK, but otherwise appears inconsistent with the proposed origin of the Neolithic in the Near East. It has been shown that certain alleles (here hgs) can accumulate in frequency while surfing on the wave of expansion, eventually resulting in higher frequencies relative to the proposed origin ,. Several of the other population pools also show a low but nonsignificant level of matches, which may relate to pre-Neolithic distributions or subsequent demographic movements (Figure 1). As I have noted before, frequency is an uncertain guide to where a lineage has originated, as Neolithic founders may have left more descendants in freshly colonized regions than in their homelands. Nonetheless, with the exception of the English, the "high match" populations are all within the broad trajectory of Neolithic populations from the Fertile Crescent to Central Europe. Hopefully more Y-chromosome results from different Neolithic sites will turn up more derived haplogroups. Haplogroup G has been implicated as a Neolithic lineage as early as Semino et al. (2010), but clearly this is just the beginning of the reconstruction of Neolithic Y-DNA gene pools, and hopefully Y-DNA can be extracted from Mesolithic samples of similar age. PCA (on the left) shows the outlier status of the Neolithic samples with respect to extant populations. Either natural selection, or later demographic events have led to a quite different gene pool today than what existed in central Europe thousands of years ago. In agreement with the PCA and MDS analyses, populations from the area bounding modern-day Turkey, Armenia, Iraq, and Iran demonstrated a clear genetic similarity with the LBK population (Figure 3A). This relationship was even stronger in a second map generated with just the Neolithic Derenburg individuals (Figure 3B). Interestingly, the map of the combined LBK data also suggested a possible geographic route for the dispersal of Neolithic lineages into Central Europe: genetic distances gradually increase from eastern Anatolia westward across the Balkans, and then northwards into Central Europe. The area with lower genetic distances follows the course of the rivers Danube and Dniester, and this natural corridor has been widely accepted as the most likely inland route towards the Carpathian basin as well as the fertile Loess plains further northwest. aDNA data offers a powerful new means to test evolutionary models and assumptions. The European lineage with the oldest coalescent age, U5, has indeed been found to prevail in the indigenous hunter–gatherers ,. However, mtDNA hgs J2a1a and T1, which because of their younger coalescence ages have been suggested to be Neolithic immigrant lineages ,, are so far absent from the samples of early farmers in Central Europe. Similarly, older coalescence ages were used to support hgs K, T2, H, and V as “postglacial/Mesolithic lineages,” and yet these have been revealed to be common only in Neolithic samples. The recent use of whole mitochondrial genomes and the refinement of mutation rate estimates have resulted in a general reduction in coalescence ages , which would lead to an improved fit with the aDNA data. Therefore at a large scale, a demic diffusion model of genetic input from the Near East into Central Europe is the best match for our observations. It is notable that recent anthropological research has come to similar conclusions ,. On a regional scale, “leap-frog” or “individual pioneer” colonization models, where early farmers initially target the economically favorable Loess plains in Central Europe ,, would explain both the relative speed of the LBK expansion and the clear genetic Near Eastern connections still seen in these pioneer settlements, although the resolving power of the genetic data is currently unable to test the subtleties of these models. Demic diffusion, at least as it was proposed initially, implies interaction between expanding farmers and local foragers, with gene pools becoming increasingly "forager" the further one goes from the source of the Neolithic. But, this is not really what we observe in the data, and there is no real evidence of forager DNA in Central European Neolithic (1/42 U5a). Whatever the terminology, it appears that genetics is adding extra firepower to the diffusionist camp of archaeological debates, and contradicting the suppositions of the acculturationists. What is most disappointing about the study is that apparently the SNPs defining the Y-clade IJ were not typed in the samples. So, the two F* samples are certainly not I or J, but they could very well already be IJ. Haplogroup IJ largely tracks the path of the farmers from the Near East to the Balkans and Central Europe, and hopefully a re-examination of the Derenburg remains can be made to include the IJ-defining markers. It is also fascinating that the presence of 33.3% haplogroup G2 in the German Neolithic is matched by a presence of 33.3% haplogroup G2 in 7th c. Bavarian knights, and maybe even the latest French royalty. The Y-DNA landscape of Europe is still largely empty in space and time, and it will be exciting to see it filled out over the next years. Certainly, the new Haak et al. study has achieved what Haak et al. (2005), and pretty much every ancient DNA study since has achieved: to surprise us. It is extremely important to note that the authors have not disproved that the F* Y-chromosomes belonged to derived clades (e.g., haplogroup I or haplogroup J) of the phylogeny. For example, haplogroup I is defined by 7 polymorphisms according to ISOGG. Today only chromosomes that possess all 7 of them seem to be extant, but these polymorphisms occurred in an unknown order in the line of descent leading to modern I men. The authors typed only M170, one of these 7 polymorphisms, but it could very well be the case that the F* samples were derived for one or more of the remaining 6 ones, and were thus either ancestors or "cousins" of extant European haplogroup-I bearing men. It is imperative for internal tree markers to be tested in the F* bearing chromosomes to determine their status. The real headline here is that "we do not find the most common Y chromosome hgs in modern Europe (e.g., R1b, R1a, I, and E1b1), which parallels the low frequency of the very common modern European mtDNA hg H (now at 20%–50% across Western Eurasia) in the Neolithic samples." R1a and E1b1 because they more or less match the geographical spread of the Danubian Neolithic have seemed natural candidates to arrive at this time period. And, given the strong evidence that there was not a large population genetic contribution from Upper Paleolithic hunter-gatherers, this imples that most Europeans have ancestery in Europe that is even younger than LBK. Of course, since we don't expect to find R1b in this region, its absence isn't very informative. But, its certainly makes it seem more plausible that R1b may be a later arrival than it is customarily believed to be. Either early Bronze Age, early Indo-European and/or Slavic population migrations now seem most plausible as the source for these Y-DNA haplotypes and for most of the mtDNA haplotype H in Central and Eastern Europe. This is about three thousand years later than previously believed. The gene pool is increasingly looking almost as young as the local language families. Also, the "Near East" description of the current populations with the closest affinities to the LBK doesn't do justice to their distribution. These are people who now live in the mountains to the North and East of the Fertile Cresent: East Anatolians, Caucusians, and Persians, as opposed to the Levantine, Mesopotamian, and Arab populations one often associates with the "Near East." There may be more merit to the racial description of people of white European descent as "Caucasian" than commonly understood. This paper is also notable for providing one of the first really clear correlations of Y-DNA hgs and mtDNA hgs in a single population. I have been saying that the assumptions about Europe's peopling will be turned on their head as reliable and provable authentic aDNA samples become available and tested. Of course I had no proof just looking at the data available did not justify any of the assumptions made about a Mesolithic hunter/gatherer continuation in Europe to the present day. I am hoping more revelations will come from aDNA especially Y chromosome haplogroups that come Mesolithic and older hunter/gatherers in Europe. Eventually the truth in science is revealed. It is wonderful to see a study made with awareness, and including all the tools are available today, using modified "genoteca" discovering a nucleus of reality, finding the thread and thinking how a sub set population coming from Near East was spreading into Europe. Yes the Truth will be expressed speedy, analyzing ancient DNA and comparing this with actual Dwellers Database. Dr. H. H. O. C.
It's too bad a Y result was yielded for only 3 samples. I'd like to point out that there are currently 2 F samples in the German FTDNA project as well as 70-80 G2a samples -- many are G2a3b tested. - This study tested LBK farmers, not anyone else from prehistoric Europe. - It showed that LBK farmers were newcomers to Europe, possibly from as far as Iran. - It showed that modern Europeans don't have strong links to these LBK farmers, nor to modern groups from the Caucasus and Iran. - It didn't show that any of the other lineages common in Europe today came later to Europe than these Near Eastern LBK farmers. - R1a tribes most likely largely snuffed out the descendants of the G and F* LBK farmers in Central-Eastern Europe, after learning a few tricks (ie. metallurgy), and expanding from north and east of the Carpathians during the late Neolithic. - These R1a tribes can probably be linked to the Northern European autosomal component that shows up in all European-wide ADMIXTURE runs, and peaks in Balto-Slavs. “These are people who now live in the mountains to the North and East of the Fertile Crescent: East Anatolians, Caucasians, and Persians, as opposed to the Levantine, Mesopotamian, and Arab populations one often associates with the "Near East." There may be more merit to the racial description of people of white European descent as "Caucasian" than commonly understood”. Then please stop to speak of Near East, better speak of Caucasus. Anyway it lacks hg. R1b and we are waiting to find it in aDNA of 8000 or more years. I think having demonstrated that it was in Italy, mostly from R1b1* to R-L51 (beyond R-U152) and here I am waiting it is found. "Similarly, older coalescence ages were used to support hgs K, T2, H, and V as “postglacial/Mesolithic lineages,” and yet these have been revealed to be common only in Neolithic samples." Did anyone sample older populations of the south half of Europe yet? "there is no real evidence of forager DNA in Central European Neolithic (1/42 U5a)"
Maybe mtDNA hg V? And maybe even mtDNA hg H (picked up earlier and souther), who knows? It's in Germany after all. "It is still compatible with the idea that R1b in the west is pre-LGM. " The map with genetic proximity shows that the Basques (a lot of R1b1b2 and rather typical European mtDNA hgs) are not closely related to these LBK from west Asia, so yes indeed. "It is still compatible with the idea that R1b in the west is pre-LGM." "The map with genetic proximity shows that the Basques (a lot of R1b1b2 and rather typical European mtDNA hgs) are not closely related to these LBK from west Asia, so yes indeed.."
I disagree. I don't see why the absence of R-M269 (aka R1b1b2) in an LBK Culture site implies R-M269 is pre-LGM/Paleothic. The 2010 Balaresque "A Predominantly Neolithic..." study and the 2010 Myres "A major Y-chromosome haplogroup R1b..." study indicate R-M269 has an east to west expansion into Europe during the Neolith. The 1000 Genomes Project supports the potential youthfulness of R-M269 when it said "striking pattern indicative of a recent rapid expansion specific to haplogroup R1b was observed, consistent with the postulated Neolithic origin of this haplogroup in Europe." "its certainly makes it seem more plausible that R1b may be a later arrival than it is customarily believed to be." Perhaps, R-M269 expanded across Europe in a later Neolithic period than the LBK. 'Extant populations' is everybody from Ireland to Iraq, who in comparison to the ancient mtdna form a homogenous bloc. The ancient mtdna results on the chart look like they came from outer space, and not from anywhere in West Asia, so your later comment that they're different from modern 'central Europe' is a "little" off, because they're 'rather different' (hell of an understatement) than anywhere in West Asia. Your idea about natural selection is almost a joke, like a desperate attempt to explain away these unreconsilable (self sic) results. Leaving 'later demographic events' as the sole explanation, but that's also unrealistic. Where did this new population come from, with higher H and no N1a? They would have to replace an agricultural, high-density population, not hunter-gatherers. It's like we now need 2 giant replacement events, first with agriculturalists carrying bizarre mtdna replacing hunter-gatherers, and then these people being themselves almost completely replaced by yet another group of agriculturalists, who this time would have had the correct modern proportions of mtdna. That's why Haak himself, when he first encountered these freak mtdna results in 2005, concluded that Europeans aren't descended from these people with high N1a and low H.
1) Modern Middle East and European mtdna are just barely distinguishable from each other, so in any decent sized sample you're bound to find some result that's more common in the opposite region. 2) Europe has 45% H and the Middle East has 25% H, and the ancient results have almost no H, so the Middle East is going to tend to have higher frequencies for the same non-H haplogroups. The y-dna results are as ridiculous, twisted and impossible to justify as the mtdna results. An honest appraisal would be that these results are all very strange and don't support any idea over another. More than anything, they call into question the validity of the ancient tests themselves, more so given the recent results of the semi-ancient mtdna of Denmark, in which agriculturalists had 3 out of 3 samples of U4 and U5, and mtdna I was found for the 2nd time in Denmark at an abnormally high frequency, both cases having a likelihood of being due to random chance of just 1 in 1000 (each) if Denmark's mtdna at the time was the same as today, which meant that either there was an incredible massive mtdna replacement in Denmark in the last 2,000 years, twice (! ), or... there is some fundamental technical issue with the ancient tests themselves. G2a3b has one of its center of expansion in Italy (where probably it was present before LBK) and F* has one of its huge presence on the islands of Adriatic Sea close to the Croatian shore. Then they could have come from there (like I think haplogroup R1b) and not from Caucasus (and less from Near East). Let's wait for a more ancient DNA from there. It's interesting how the Figure 3B map shows more green on the north side of the Black Sea rather than around the Bosporus. Wasn't the Black Sea significantly smaller back then since it was disconnected from the Mediterranean? I wonder if these farmers took a northerly route through the Caucasus and settled along the north side of the Black Sea, only to see the land sink when the Black Sea got flooded around 5600 BC. The timing of that event seems curiously close to the expansion of the LBK culture. Perhaps the age of y-chromosomal Adam is underestimated? If a researcher finds R1b1b2 in ancient human remains of Mesolithic or Paleolithic (western) Europe I believe this would be strong evidence for a much older y-chromosomal Adam perhaps between 150,000-200,000 years. If y-chromosomal Adam is a similar age to mitochondrial eve there would be no problem for R1b1b2 to be of Paleolithic origin in Europe. Perhaps we should question the 10 year old claims of Spencer Wells. I found another way to illustrate the absurdity of these ancient mtdna results. The farmers come into Europe with 20% N1a, 10% H, and 0% U4/U5. They encounter the aboriginal Europeans with almost 100% U4/U5. Today, U4/U5 makes up 10% of Europe's mtdna, so they were absorbed as a significant minority element into the new population. The new combined population would have something like 20% N1a, 10% H, and 10% U4/U5. Today, Europeans have 0.2% N1a, 45% H, and 10% U4/U5, so N1a has shrunk by a factor of 100, while U4/U5 has remained unchanged. That's a huge point, which can't be explained by later population movements: if yet another massive wave of farmers displaced the 1st wave, then N1a and U4/U5 would be equally affected, so that if the people caused N1a to drop by a factor of 100, then so too U4/U5 should have dropped by a factor of 100. The 2 haplogroups couldn't somehow have been differentially affected by population movements. A 100-fold difference in the Neolithic-versus-modern ratios of N1a over U4/U5 is not trivial, it's a hell of a difference, way beyond the threshold of statistical significance. This means that whatever affected N1a affected it differentially, and that means only one thing: it was evolution. Forcibly, the only possible explanation for N1a's mysterious disappearance is that it was affected by natural selection. There is no "2nd wave of farmers" to explain these results. You are absolutely forced to accept that N1a must have been affected by natural selection. A-B-S-O-L-U-T-E-L-Y. No other explanation. It HAD to be evolution, period. And we are thus almost on the verge of being able to formally declare that these results are an impossible joke. The lead suspicion here shouldn't be farmers or hunter-gatherers, it should be wether the tests are producing erroneous results. "Perhaps the age of y-chromosomal Adam is underestimated? If a researcher finds R1b1b2 in ancient human remains of Mesolithic or Paleolithic (western) Europe I believe this would be strong evidence for a much older y-chromosomal Adam perhaps between 150,000-200,000 years. If y-chromosomal Adam is a similar age to mitochondrial eve there would be no problem for R1b1b2 to be of Paleolithic origin in Europe. Perhaps we should question the 10 year old claims of Spencer Wells." And the trend is not to estaminate higher ages but to estaminate them younger and younger every year that passes. I have seen the estaminated age of R1b drop from 40.000 years to 26.000 and then to 16.000 years already. With TMRCA estaminates already scratching at the 6.000 years (for example TMRCA of European R1a and I1). Wich would mean, TMRCA of European R1a and I1 have lived during in the time of the LBK. The R1b SNP that dominates Dutch, Danish and German R1b is of a similiar aged TMRCA. So what R1b, R1a or I1 lines we would find in LBK lineages, would be lineages that did not make it into the modern time, because they are from before TMRCAs of modern European haplogroups. Aargiedude, first of all F* could very well be ancestral to almost all European Y-chromosomal clades. This Neolithic F* could very well be more related e.g., to haplogroup I than to extant F*. Second, it is of course possible that N1a was differentially affected by natural selection. It's not easy to understand what you are arguing. It seems to me that you have an irrational attachment to some notion of Paleolithic continuity that is simply not supported by the data. "And the trend is not to estaminate higher ages but to estaminate them younger and younger every year that passes." It sure is a trend - but that doesn't make it necessarily correct. Even the Haak data from this paper are in contradiction with some published mtDNA estimates (meaning some of the estimates are now at least a factor two too young). Dienekes has a pretty good point. Could these F* guys be the direct ancestors of I1* and I2 branches, rather than lineages that just died out? I2* is spread thinly from Asia Minor to England, and his descendants in lesser degrees everywhere in between. The I1* ancestor could have populated less densely populated Central Scandinavia first which would explain rapid growth there. I2 descendants might have had a rougher time with populated Western Europe and explain an additive population, rather than a replacing one. Keep in mind that the LBK hit Central Europe in several waves in which we could see both F* (ancestor to I1? I2 branches?) as well as G2a3. young estimate for y-chromosomal Adam. ''And the trend is not to estaminate higher ages but to estaminate them younger and younger every year that passes." The trend does not necessarily reflect reality unless you are a follower of Scientology. Thus the TRMCA-estaminates-/estimates may very well be wrong. "So what R1b, R1a or I1 lines we would find in LBK lineages, would be lineages that did not make it into the modern time, because they are from before TMRCAs of modern European haplogroups." I was meaning to explain that if a researcher found R1b1b2 in ancient Mesolithic and/or Paleolithic European human remains this would prove that R1b1b2 is older than the present estimates and therefore most likely it would serve as much evidence for the much overlooked option of a older y-chromosomal Adam. Of course if ancient DNA proved your theory I would agree with you. In other words we must be open minded to new theories even if they suggest something unusual like “Spencer wells underestimated the age of y-chromosomal Adam”. Thank you for your thoughts and commentaries they have given me much food for thought. Grannollers Barcelona apparently showed little discontinuity to modern populations "http://www.ncbi.nlm.nih.gov/pmc/articles/PMC2706191/?tool=pubmed". It even had a case of U4. As for Mesolithic/Paleolithic human remains I really wise someone would test the DNA (y-dna or mtdna) of pre-neolithic populations in the Iberian peninsula. comes to the conclusion that much (if not all) of the LBK N1a is of local European origin - further strengthening the idea that the "weird" LBK makeup is largely just due to its random local Danubian origin, and then further exaggerated by rapid expansion and drift. "I have seen the estaminated age of R1b drop from 40.000 years to 26.000 and then to 16.000 years already. With TMRCA estaminates already scratching at the 6.000 years (for example TMRCA of European R1a and I1)." It's new to me, which paper do you cite from? thanks! There's a fellow from Prague,Czech Republic who also belongs to G2a with the uncommon value DYS388=11. Maybe someone can say more in respect to the Topic "Neolithic farmers". By the way I am of Palestinian decent and also belong to G2a3. "It's new to me, which paper do you cite from? thanks!" "It sure is a trend - but that doesn't make it necessarily correct. Even the Haak data from this paper are in contradiction with some published mtDNA estimates (meaning some of the estimates are now at least a factor two too young)." What about the age estamination for "Blue Eyes"? To my opinion, blue eyes seem to correlate to the northern European aDNA cluster. Countries with 70% Northern Cluster have 80% or more blue eyed people, even through its a recessive trait. Countries of 55-65% northern Cluster are at 50-80% blue eyed people. Countries at 30% northern Cluster have 20-50% blue eyed people. And countries of 20% northern Cluster are at 1-19% blue eyed people. But if its correct that the blue eyes mutation is only 6.000 years old.... it would somehow mean, the whole northern cluster is only 6.000 years old. And it would mean, that R1b dominated terretories like the British Isles and R1a dominated terretories like Russia (two regions where more than 50% of the population has blue eyes) meet at the blue eyes MRCA, only 6.000 years ago. (this is not even fully off topic, since, if the age estamination is right, TMRCA of all blue eyed humans lived in the time of the LBK. The British Isles and Scandinavia adopt farming and herding later than any other populations in Europe, so if blue eyes arrived ca. 6,000 years ago, that wouldn't be inconsistent with a British Neolithic source that appears to have had a substantial demographic component. Also, from that date onwards, it appears the British Isles were in uninterrupted sea trade up and down the Atlantic Coast. Britain also saw a significant demographic infusion from Scandinavia ca. 1000 CE, during the Norman Conquest which also would have greatly increased the social cache of Scandinavian appearance giving its sexual selection advantage, and had prolonged back and forth military and territorial disputes with Scandinavians for hundreds of years up until then, and with Brittany which had similar experience with Scandinavians before it had an impact on Britain. The Russian nation was established by a foreign ruling class of Scandinavians. Clearly there was a major demographic transition in much of Europe in the early Neolithic. It also seems highly likely that there was a major Indo-European demographic transition that hit at various points from the early Bronze Age to the early Iron Age depending on where you look. It isn't clear to me whether or not there was in intermediate demographic transition between these two events (largely lost to history), or whether any other demographic change happened during the Roman era or later. Perhaps the people who created the Linear Pottery culture were like the Roma (except wealthier) sparsely populated exotic nomads with unusual burial practices (in a world of cremation? F* has one of its huge presence on the islands of Adriatic Sea close to the Croatian shore. Y chromosome variation in 457 Croatian samples was studied using 16 SNPs/indel and eight STR loci. High frequency of haplogroup I in Croatian populations and the phylogeographic pattern in its background STR diversity over Europe make Adriatic coast one likely source of the recolonization of Europe following the Last Glacial Maximum. The higher frequency of I in the southern island populations is contrasted with higher frequency of group R1a chromosomes in the northern island of Krk and in the mainland. R1a frequency, while low in Greeks and Albanians, is highest in Polish, Ukrainian and Russian populations and could be a sign of the Slavic impact in the Balkan region. Haplogroups J, G and E that can be related to the spread of farming characterize the minor part (12.5%) of the Croatian paternal lineages. In one of the southern island (Hvar) populations, we found a relatively high frequency (14%) of lineages belonging to P*(xM173) cluster, which is unusual for European populations. Interestingly, the same population also harbored mitochondrial haplogroup F that is virtually absent in European populations – indicating a connection with Central Asian populations, possibly the Avars. periods about 6–10,000 years ago (Cavalli-Sforza et al. this phenotype (Cavalli-Sforza et al. 1994; Myant et al. Selection as suggested here changes the area of predominant features. "The Russian nation was established by a foreign ruling class of Scandinavians." The same is true for a lot other places. Still, a lot of these places are not as "Northern" as say Russia. Lombards for example. Their "mythological" (claimed, but unproven) origin is Norway. Oldest proven settlement is northern Germany. For some time they established a kingdom that was more or less Switzerland combined with Austria. And finaly they established a kingdom that was the northern half of Italy, wich is still named by their tribal name "Lombardy". But the people of "Lombardy" have less than 20% blue eyes and almost as much "Northern aDNA"
Slavs however did are "rough people with red hair and blue eyes", by the claim of the Romans that first recognised them. Thats centuries before the Swedes found "Rus". Tacitus used a similiar depcition of Germanic tribes, centuries earlier: "In one thing they are all the same: huge frames, red hair and blue eyes"
He says, their huge frames, red hair and blue eyes show clearly that they must originally be of Germanic origin. So, we have a "before 400AD" description of Picts, Germans and Slavs as beeing "northern European" looking. Tehre is also a description of Gauls in the time of the Gallic war of Ceasar. Claiming Gauls as fair haired and fair eyed people. Fair haired, blue eyed R1a1 "Skythian" corpses (question is, if those belonged to "original" Iranian "Skythians" or assimilated north-east Europeans). Also, would Swedish RUS explain 60-80% "Northern aDNA" in Russia? A few Saxons, Angeles and Vikings another 60-70% in British? What about Irish? Also 60% northern European aDNA without much known (historical) "Germanic" impact, except that even the Irish R1b has highest microsatellite diversity in Germany. On the other hand, Lombardy (Northern Italy), where Celts lived, where Germanic Goth and Lombards estabilished kingdoms...and wich was in a multiple Monarchy with Germany for centuries (King of the Germans, King of the Lombards, King of Burgundy and Holy Emperor of the Romans)....with as few as 20-25% "northern aDNA". Thats fewer than that of Spain and Portugal!. Thats why I think the "northern European" connection must be older than that of medieval migrations. But what needs to be explained is why the Northern aDNA cluster has so different Y-DNA. Thats quiet some variation for countries that are suposed to derive 70% of "all lineages, including the drifted or otherwise lost ones" (what aDNA promises to archive) from the same "Proto-Northern peoples" pool. @ Fanty : "But if its correct that the blue eyes mutation is only 6.000 years old"
The estimation you're talking of is between 10,000 and 6,000 years IIRC and you can bet the content of your bank account that it's older than that (same for blondness and white skin, I'm pretty convinced it's not as "recent" as it's been claimed recently). Actually the paper gives the presence of YDNA F* (whichever subclade it is) at 1,3% that isn’t a little for Europe and only a deep exam could answer if this subclade is European or from elsewhere. We are always waiting for an ancient R1b, that wasn’t in LBK. Perhaps next year we’ll have an answer from Oetzi. "The estimation you're talking of is between 10,000 and 6,000 years IIRC and you can bet the content of your bank account that it's older than that (same for blondness and white skin, I'm pretty convinced it's not as "recent" as it's been claimed recently)." But those guys use 30 years generations for the top numbers (10.000). Also the lower number 6.000 fits wonderfully with other TMRCAs. And thats NOT the lowest numbers. The lowest estaminates that float around use ages HALF of that. On the other hand is MCRA calculation based on say, haplotypes, surely crap. Genet. 2000, Richards M,et al: “We conclude that (i) there has been substantial back-migration into the Near East, (ii) the majority of extant mtDNA lineages entered Europe in several waves during the Upper Palaeolithic, (iii) there was a founder effect or bottleneck associated with the LGM, 20,000 years ago, from which derives the largest fraction of surviving lineages, and (iv) the immigrant Neolithic component is likely to comprise less than one-quarter of the mtDNA pool of modern Europeans. results of Tartu and Haifa groups). Other: from mine article April 2001 and Oct. 2010 This 42% mtDNA -include "N1" “G nucleotide variant of M.E. and E.A.” - individuals carrying these mitochondrial markers- as well from a fifth to seven mothers that includes the "L1, l2" and "M1" haplogroup also with origin from the Wide or extending Middle East that includes Abyssinian region – who represents 50 % mtDNA of the nowadays Ashkenazi community. See too: Laurie J. Ozelius et al 2006. "The leucine-rich repeat kinase 2 (LRRK2) G2019S mutation is the most common genetic determinant of Parkinson disease (PD) in Ashkenazi Jews and North African Arabs with PD." It has been seen, in this paper like Neolithic Nb1 at High frequencies in LKB culture also is present striking in Ashkenazim today at high rates (10 at 12%) perhaps for bottle neck effect. in number and before in times towards II century AE -or before yet- to Central Italy in VII century AE – when Muslim invaders- and after the North and the East of Europe, they possess actually –more in ancient times- maternal mitochondrial markers mtDNA L1,L2 (4%) from Abyssinia, and the sibling N1b (10-12%) and M1(2%)-Behar el al 2006, Also Ovadia et al 2010- linked with L3 from Abyssinia – Ethiopia and Eritrea also Somalia- and Near East. display figures from these, as well as Y and mtDNA markers - . people into Ethiopia and Israel in ancient times. "Thats why I think the "northern European" connection must be older than that of medieval migrations". I agree - there likely has been a ~stable N/S gradient from shortly after the Younger Dryas (but originally going back before than). Sometimes a few people migrate this way or the other, sometimes responding to changing climate, but that does not change the overall picture. For example, when cattle-farmers introduced IE/Italic to Italy, they did not come from Scandinavia. They came from the Alps and immediate surroundings, likely the Eastern portion - a region that perhaps only had 50% blue-eyed, light-haired people to start with (because of the pre-existing gradient). Mix that with the darker indigenous non-IE population, add a bit of counter-selection against these traits, and what are you left with? Pretty much the same you started with. "But what needs to be explained is why the Northern aDNA cluster has so different Y-DNA". I agree - but that may not be that hard. As I said before: y-DNA is a horrible indicator of autosomal DNA. After ten generations (~200 to ~250 years), the original y-donor's (father's) autosomal contribution is 0.1%! horacioh you are banned from the blog for your constant comment spamming. I have not sent you any spam, only an issue about N1a mtDNA in Ethiopians that you have not published. “In this respect, Ethiopians differ explicitly from most other sub-Saharan African populations studied thus far.Within Ethiopia, the frequency of "N" lineages is significantly higher (P > .05) in samples that originate from its northern territory (48%), which was the center of the Aksum kingdom, than among other Ethiopians, mostly originating from the south-central part of the country (27%). At the same time, there was no significant difference in the proportions of haplogroup "N" between the Semitic and Cushitic linguistic groups in our sample—for example,between Amharas and Oromos.” This includes Ethiopian Jews. Note also that now Ashkenazim have 24% of E3b1, more than Sephardim 19%-20%. "A high proportion of Ethiopian lineages "N1a", significantly more abundant in the northeast of that country -48%-trace their western Eurasian origin in haplogroup N through assorted gene flow at different times and involving different source populations"-Egypt-N.E.etc-. @aargiedude old comment I know, but there's a couple scenarios. First, I do think it's possible that R1b in ancient genes somehow can decay to appear as G. Just look at the 'nonpaternal' claims for various figures that are (oddly) G which you don't really expect, and have children who are r1b. But mainly I think you have sample issues when you look in neolithic sites in fancy graves and you are not getting a truly random sample. If you could test truly randomly things might be completely different. Also, I assume that things would be much less homogenous back then, and groups would be very separate from village to village. Over time though they would merge together and indeed negative selection against these 'funny' clades could easily come into play. So some great family starts a new colony, for a while these clades expand then eventually more and more HG become part of the society and overwhelm this originating branch. Also LBK seems to be an intrusive element that has a backtrail to the SE and could have come from far away, and seems to have been wiped out. They were also cannibals, so I'm just as glad they did not seem to contribute much to the DNA of europe.